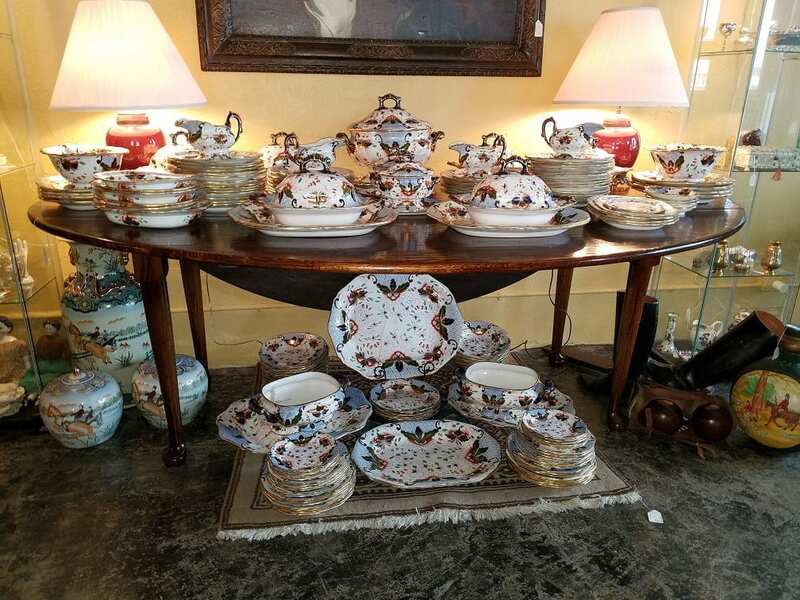 PRESENTING an EXTREMELY LARGE Early 19C Davenport Longport Imari China Dinner Service from circa 1810 - 1820. 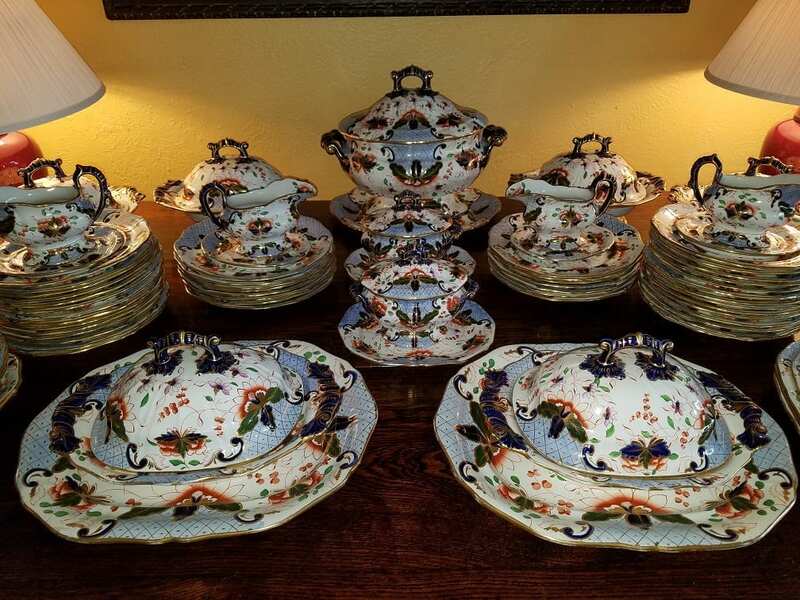 This is WITHOUT A DOUBT the finest Dinner Service we have EVER seen!! It numbers 175 pieces in total......it was MOST DEFINITELY made for one of the large Manor Houses in the UK during the Reign of George III. (Downton Abbeyesque!!). Just consider the Dinner Party where you would need 60 Dinner Plates. The pattern is an homage to Japanese Imari....with classic Imari cobalt blue, orange, green, and pink floral design all accentuated by GORGEOUS 24k gold gilt work. 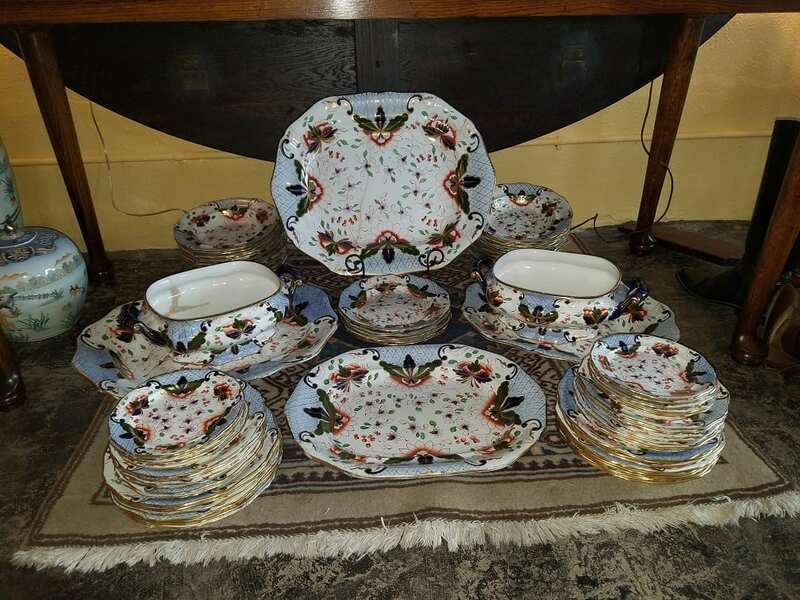 What makes this particular pattern and service SO RARE and OUTSTANDING is the incorporation of royal/sky blue patterns on all pieces. You could search all your life and not find this pattern....let alone a Service of 175 pieces. John Davenport, born in 1765, is said to have begun potting in 1785, first as a workman, and later as a partner with Thomas Wolfe of Stoke. 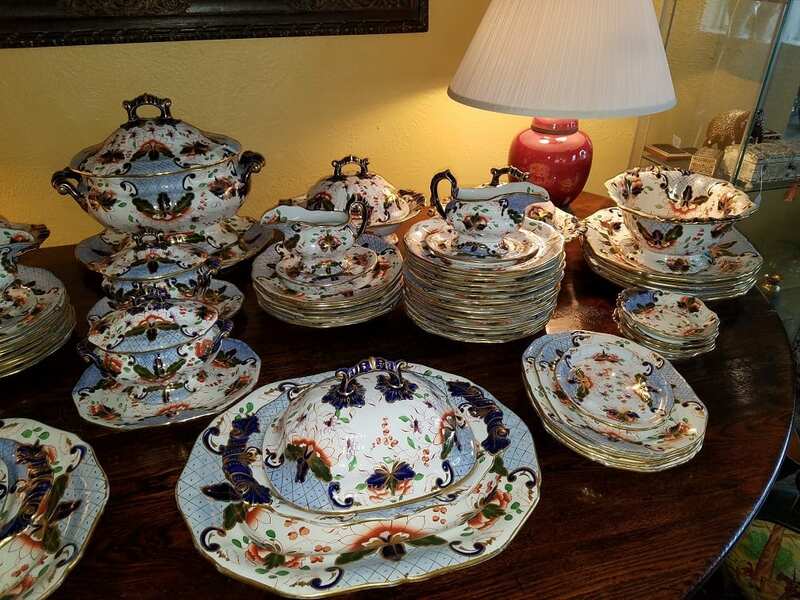 He acquired his own pottery at Longport for the manufacture of earthenware in 1794. In 1830 he retired, and his two sons Henry and William carried on the firm until 1835, when Henry died. This style of the firm then became William Davenport and Company. William died in 1869, and his two sons took over the direction of the business, which remained in the family until 1887. At the beginning, earthenwares only were made, of which blue printed and formed a large part. 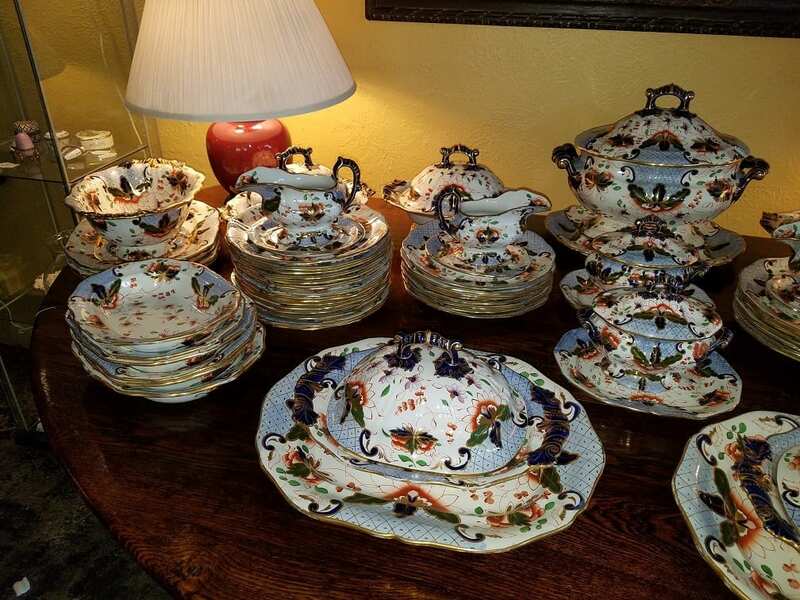 Porcelain was not manufactured until about 1815. 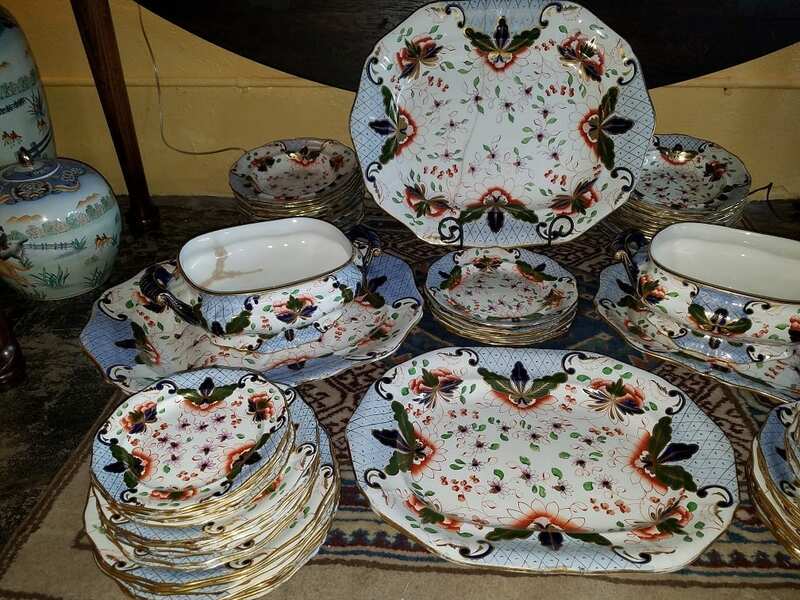 During the whole existence of the firm underglaze blue transferware printed earthenwares and wares were made in very large quantities. Many different bodies were used, including a stone china. The blue varies from a light to a medium color. Willow patterns were made extensively, and unlike most of the other potters, chinoiseries of different designs remained one of the key motifs of their printed in patterns over the whole period. These are seen on every conceivable type of domestic ware. 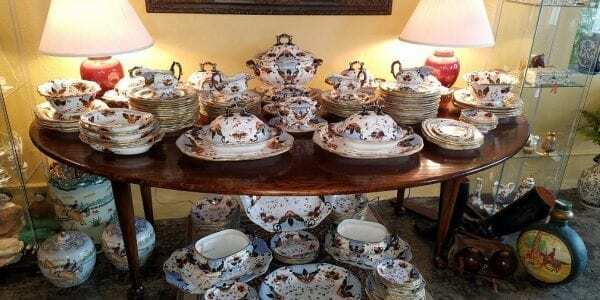 Baskets with openwork sides, and plates and dishes with pierced and wicker pattern borders, were made in quantity. Other designs of floral patterns, romantic ruins and pastoral scenes were used. No named English scenic views appear to have been made, nor did the firm cater for the American market in this type of ware, although a view of the city of Montreal is reported in one American book on pottery. 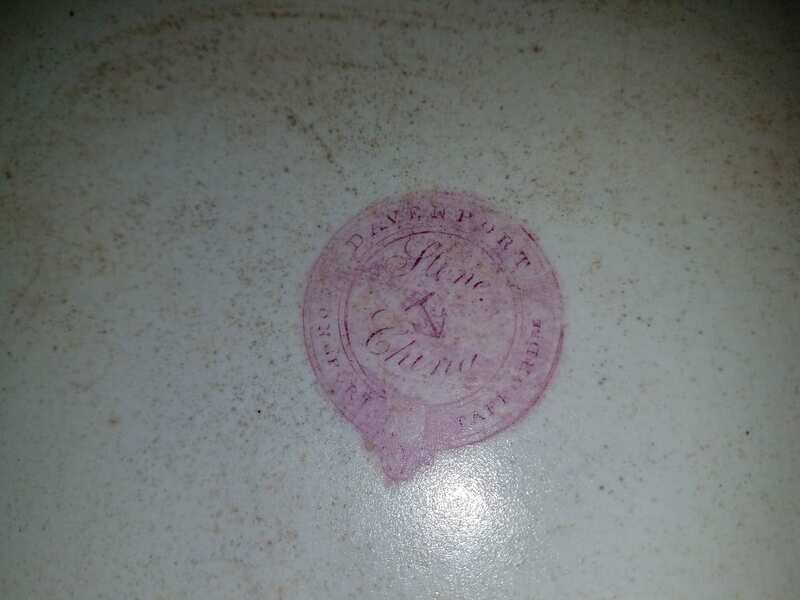 It is probable that many of the earliest pieces were not marked, but judging from the number of 19th-century pieces which still may be found it must have been rare for a piece made after 1800 not to have been marked. 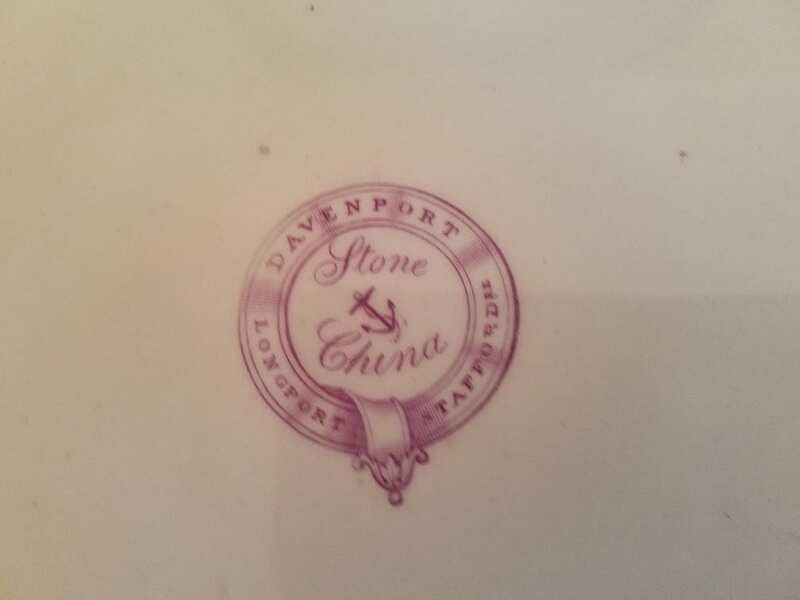 The earliest mark was the name "Davenport", impressed in lower case letters, with or without an anchor after 1805, the name more often appears in upper case letters. Occasionally the anchor appears alone. The word Longport is sometimes substitute for Davenport. REGENCY ERA: The Regency in the United Kingdom was a period when King George III was deemed unfit to rule and his son, the Prince of Wales, ruled as his proxy as Prince Regent. On the death of his father in 1820, the Prince Regent became George IV. The term Regency (or Regency era) can refer to various dates with some given a longer period than the decade of the formal Regency which lasted 1811-1820. The period 1795 to 1837 (the latter part of the reign of George III and the reigns of his sons George IV, as Prince Regent and King, and William IV) is oft attributed as the Regency era characterised by distinctive trends in British architecture, literature, fashions, politics, and culture. The Regency era formally ended in 1837 when Queen Victoria succeeded William IV. THIS TRULY IS A 'ONCE IN A LIFETIME' OPPORTUNITY! 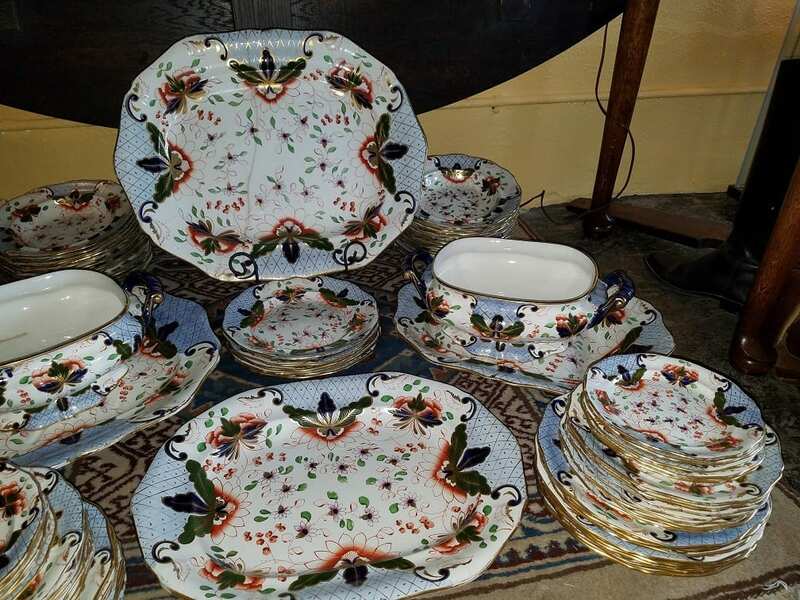 Large Early 19C Davenport Longport Imari China Dinner Service. Provenance: From a Private Collection in Houston, TX. The service was originally purchased by an ancestor from Cains Inc. (High-End Dealers) in Bossier City, LA in 1979 for a 'SUBSTANTIAL' sum. We possess the receipt. Condition: Excellent. 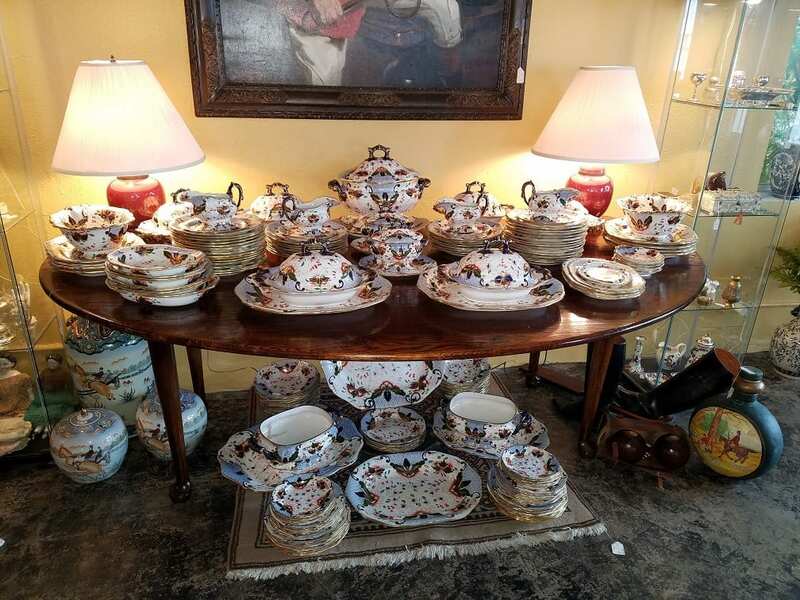 The largest game platter has a historic repair (metal staples) and one open tureen has a crack and historic repair.....otherwise this Service is 'MINT'. 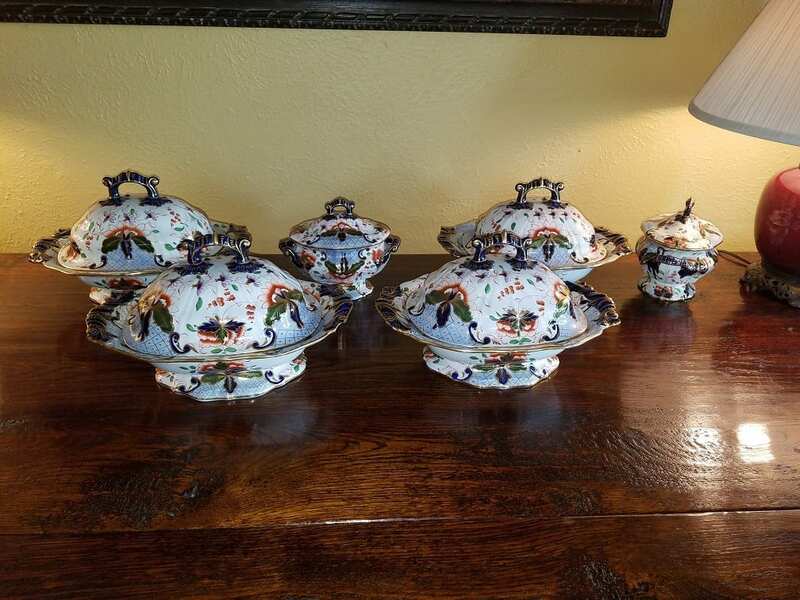 A single Tureen, similar but not this pattern, would cost you over $3,500 and a single Plate around $500....from a High-End Dealer......now do the math! !